I know. There are no tacos in this salad. It’s not much more than a recipe for a wannabe taco salad. However, the flavors found in this salad are reminiscent of flavors in a taco. Flavors such as: cilantro, lime, crispy corn chips/taco shells, avocado, lettuce, and tomatoes. Those were always some of the repeat ingredients that appeared on taco night at my family’s house. Growing up, I had so much fun loading up my tortilla shells with as many toppings that would fit. This time, I was able to load up a salad instead. 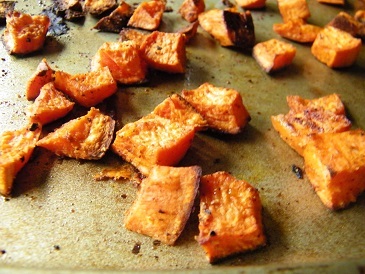 I also made chili spiced sweet potato home fries to serve alongside the salad. Each small piece of potato packed some heat and added a spicy flavor compared to the more mild taste of the taco salad. 1- In a bowl, combine the lime juice, cilantro, seasonings, and garlic. Whisk it all together. Then slowly begin adding the olive oil as you whisk the dressing. Toss the salad in the dressing once the dressing is combined. 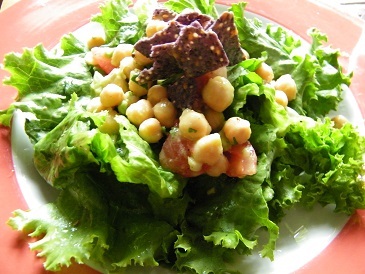 Then top the salad with the cilantro-lime chickpea salad and tortilla chips. 1- Preheat the oven to 350 degrees. Then peel the and dice the sweet potato. Coat it in olive oil and add the spices. Mix with your hands to ensure each piece has spices on it. Then stick the pan in the oven for about 30 minutes. Serve immediately and enjoy! Looks really good! Perfect for the season.